- the war machine too needs one or two free hexes to be able to evade. 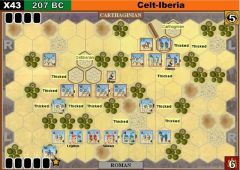 The barbarians put a lot of pressure on the right wing of the Roman legions and, thanks to a couple of good rolls, achieved local superiority, eliminating two Roman medium units and one auxilia. The rest of the game was a cat and mouse exercise in the central section. Brent masterfully managed to survive while bringing his left wing near my isolated troops in the top left section. That gave him another medal. But the next turn the slave warriors assaulted scattered Roman light infantry and won the battle. Today I've had the lucky rolls I missed yesterday. Last edit: 3 months 4 weeks ago by g1ul10. Apparently, Spartacus was not only able to inspire his troops on this day, but he prayed to the correct gods. 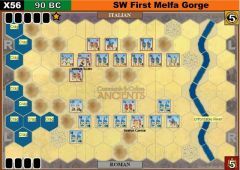 Loaded with Leadership, Counterattack, Double-Time, and Medium cards throughout the battle, it seemed that fortune favored the slaves on this day. After some initial skirmishing and positioning, the slave right side was able to win the day, charging out of the woods led surprisingly by the heroic efforts of the light horse, whose sacrifice paved the way for victory. A double-time card allowed three units to gang up on a wounded M for the final banner. 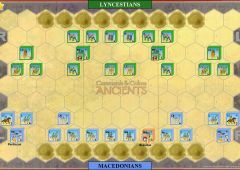 The ability of the Slaves to attack the isolated Roman right proved to be the difference, allowing the concentrated W and M units to punch through the Legions. Thanks to Max for his flexibility that allowed us to find a time to play. Two great games vs. a great opponent. Very evenly matched, both games hinged on just a couple of key rolls and cards. 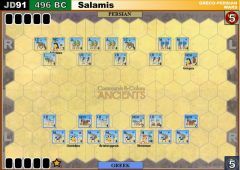 Game 1: The Slaves (Greg) made a massive move against the Roman center, but fortunately a single Roman M was able to hold off three full strength warriors and allow the center to eliminate them on the following move. 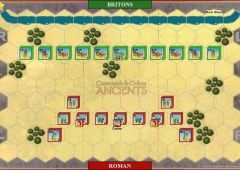 A back and forth battle for the center would decide the game, with a well-timed Spartacus card saving the day (ironically) for the Romans. Game 2: Slaves (Travis) made an early concerted effort to trap and destroy the isolated Roman (Greg) detachment on the Roman left. 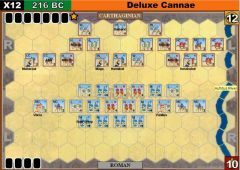 An abundance of excellent cards and fortunate rolls allowed the Slaves to hammer 3 of the units, but some unbelievable rolls allowed a lone unit and leader to escape to rejoin the Roman main lines, who used the opportunity to press the center of the Slave formation. 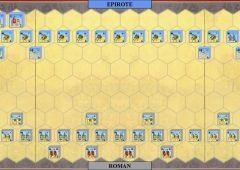 Fortunately, the Slaves were able to hold off the Romans in the center and Roman left, and Spartacus himself was able to finish the battle with an extremely lucky roll charging downhill on the Roman right. 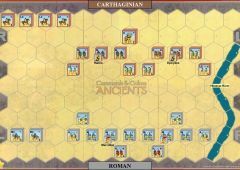 That game saw a very aggressive play on slave left / roman right with the other side completely neglected. 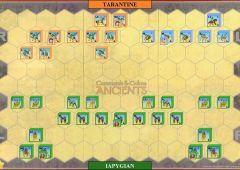 The game can go any way really, as in the end both sides had a lot of 1 and 2 block units. 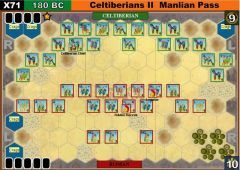 The action was so quick and intense in the center, that it was very hard to bring new units to the fight from far away. 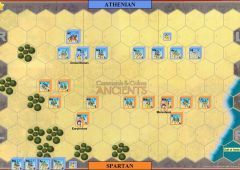 Opposite to first game, the action was mainly on Roman left / Slaves right, near hills were 4 detached Roman units were located. The managed to put a really good fight but in the end were killed. For a long time the score was 5 to 3 for Brent and everything can happen. 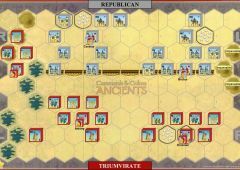 The stalemate lasted for 3-4 turns and then after DT attack, the Romans finally crushed rebels, gaining 3 banners in two turn, including lc2d. Thanks to Brent for playing the games, especially after whole day at work. It was as always a pleasure. And now, to the final! For all interested, we will be starting final with Travis in couple of minutes.